The Little Paw Paw Cafe is a hidden gem on Kitchener Road, Kedron. For those who regularly traverse the back streets to uncover cool little cafes, they'll already know that the Little Paw Paw Cafe is a great place to catch up with friends. Part of the Venzin Group of restaurants and cafes, Little Paw Paw offers delicious fresh meals at good prices. Open for breakfast, lunch and coffee catchups, the Little Paw Paw Cafe isn't big, but what it lacks in size it makes up for in delicious mouthwatering food. With a menu consisting of wholesome healthy foods, vegetarians, vegans and allergy sufferers will delight in the tempting dishes on offer. 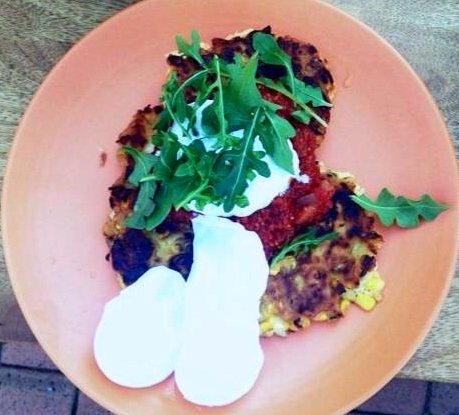 I tried the Corn and Zucchini Fritters with Smoked Relish and Sour Cream. Although the meal filled me up for lunch, I could have easily eaten another serving of it because it was just so delicious. My lunching companion had the New York Bagel with Sriracha Whipped Cream Cheese, Rocket, Bacon and Haloumi. Again, fantastically scrumptious. Breakfast options such as Porridge, Braised Truffle Mushrooms and Avocade on Sourdough are available. I can't wait to go back to try the Wagyu Cheeseburger. For full menu options see here. One very refreshing thing about this cafe is the lack of softdrink. Commercial drinks such as Coke don't exist in the fridge. Instead opt for juice, flavoured mineral waters and like. The change in pace suits the food. Somehow you just don't want to combine the fresh flavours of the food with unhealthy softdrink. If you still need your caffeine kick though, the coffee here is great. Boasting soy, syrups, decafs, extra shots and baby cinos as well as the usual array of coffees, you won't be disappointed by the taste. If there was one downside to this cafe I would say that there isn't a lot of tables, which on a Sunday morning with groups of morning joggers and cyclists ending their routes here, you could be left waiting for a table. However, the more quaint size of the cafe adds to its appeal. If it was too large it would feel more like the mainstream consumerism cafes around. The Little Paw Paw is friendly and personal. The tables are partly in the shade with some in the sun, so if soaking up some vitamins takes your fancy then this will suit you, but it could get hot in the middle of the Summer months. You could wait for a shade table though if this bothered you. All in all, the great tasting food and quirky atmosphere of the Little Paw Paw Cafe will see me going back again...and soon. Little Paw Paw Cafe is open 7 days from 6.30am for breakfast and lunch.